New parents might also like the idea of introducing everyone to the new baby at the same time, which keeps those well-intentioned-but-unexpected visits from neighbors and friends to a minimum. When they call, just let them know a party is in the works and they’ll get to meet the baby soon. Lastly, a Sip & See is a fun way to introduce a second, third, or fifth baby to the fold. Often, these kids don’t get baby showers thrown for them, so it’s a nice way to make sure they get the attention they deserve. Give yourself a month or two. You don’t have to have a Sip & See the week your child is born. It’s best to wait until your baby is a little stronger, Mom is getting a little sleep, and you’re comfortable letting others handle the baby. Send invitations. Sip & Sees are a new idea in many parts of the country, so there will be questions. 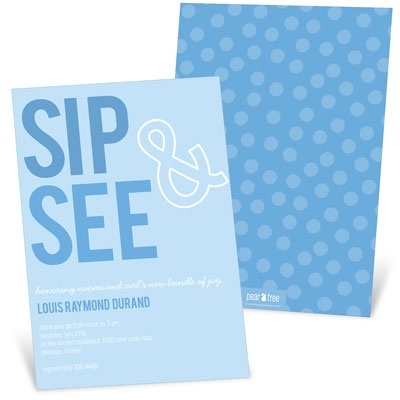 Your Sip & See invitations should spell out everything: who’s hosting it, what time and where, and what’s being served. If you’ve already had a baby shower or two, you may want to specify ‘no gifts,’ or ask guests to bring something specific, like diapers or a donation to a charity, instead. Make it an open house. This keeps it casual. Guests can come and go, and no one will be expecting a sit-down five-course meal. Serve snacks, hors d’oeuvres or desserts to make it easy. And something to ‘sip,’ of course! Take pictures. Assign a friend or hire a photographer to take pictures of everyone with the baby. These will become precious memories later. Open gifts later. Gifts (if you get them) are usually opened after the party is over. You’ll need to send coordinating thank you cards, of course, but that might be a good excuse to send everyone a print of their photo with the baby! Tired of the same old baby shower games and stuffy brunches? 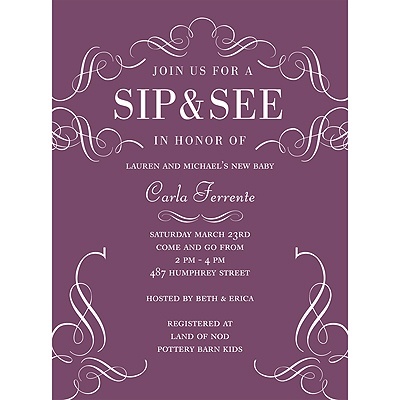 Why not introduce your new baby to friends and family with a Sip & See! It’s the latest idea in baby shower ideas. And for more baby shower ideas, keep reading our blog. I love this baby shower idea! A Sip & See party is great for those of us who are adopting a child! Thanks for sharing such an inspiring idea! A very practical, but excellent idea you have there. I think new parents will also love this SIP & SEE Idea for a baby shower. Thanks for sharing this ides to all of us. You’re welcome, Beverly. We agree, we think this will be a fun alternative for parents! I have no idea with this thing that we called “Sip and See” and I don’t even know what would happen in that kind of event. I’d like to ask, which is a better a normal baby shower or the Sip and see? Both sounds a good idea, but can’t decide what will I choose. Hi Shannon, congratulations on welcoming your new bundle of joy soon!! It is a tough decision and up to you on what you would like better. A shower before welcoming baby or a shower after baby is born to introduce him/her to loved ones. We wish you all the best in deciding! !